Learn more about Non Random Profits at http://www.nonrandomprofits.info. New article expresses Advisor’s Capital Investments Inc research and opinions on this topic. Also discusses The New Executive Intelligence Network and its application designed to benefit executives and advisors as an educational forum. This should matter to you because big growth is occurring in Chinese internet stocks. Compared to U.S. stocks like Apple, Alphabet, Amazon, Facebook and Netflix, it appears the stock growth potential is far greater, especially over the next twelve months. 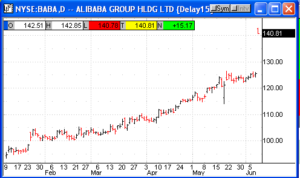 I believe the pullback in Chinese stocks in general represents a buying opportunity for these particular stocks. Even if China experiences a recession in many of its over-leveraged industries, this industry does not share the same burdens. These stocks are in the mark up stage right now and I believe they are not yet over extended. The monthly active user base grew 30% last quarter to 340 million users. these stocks are capturing market share and growing at a phenomenal rate. Earnings are way above analyst expectations and the stocks are quickly adjusting to reality. Investors should take care to buy on dips after news like this. Professionals will take profits on the news. EARNINGS SURPRISES ARE DRIVING MASSIVE GAINS! This is really a big deal. The growth ahead could easily rival the growth we have already seen in U.S. internet stocks over the past ten years. Buy only the best quality stocks. There is plenty of opportunity. Don’t speculate on smaller more speculative issues. Stay with the dominant market leaders. These stocks are not for the timid. Volatility can be expected to be as much or greater than internet related stocks in the U.S.
All investments have risk. Past performance is no guaranty of future results. This type of investment is not suitable for everyone. This is not personal advice. This is published for informational purposes only. For personal advice call me at 860-963-0722 and I will answer your questions. This network is being launched on Linked In. The focus will be on intelligence gathered by executives concerning special situations in equities. Executive contacts and specific expertise often have immense value in uncovering exceptional opportunity for investment. During my 48 years in the investment business many of the very best investment opportunities came from my executive clients. I remember back in the late seventies a utilities engineer from New York told me he was buying many millions of shares of Telephonos De Mexico for .125 cents per share paying 10% in dividends. This investment eventually made him extremely wealthy. More recently over the past few months a client asked me to buy a biotech stock that was not heavily covered by brokerage firms and it doubled in a short few months. This was the inspiration for the creation of this network. We are not interested in inside information. We simply seek information about special situation securities that are not receiving Wall Street attention. Brokerage firms generally advise and follow a limited number of higher priced stocks that are already heavily owned by institutions. They neglect special situations that might be low priced. This is our network’s primary interest. We are not looking for penny stocks, but companies with real value and breakthrough opportunities that are not widely known by institutions. We are not looking for short term trades or small gains. We are looking for a potential of 100% gains or more over a period of four to five years. I have found that these opportunities are found in pre IPO investments, IPO’s and publicly traded stocks that fall out of favor and find new life based on some triggering event. When these opportunities present themselves it is helpful to have help from someone who has the experience, expertise, technology and tools to help determine the correct price to pay and to develop a plan for risk control before purchase. I have the expertise and the resources and have spent my working life refining these skills, especially as pertains to out of favor companies. As curator I will attempt to be helpful. I believe you make your money when you buy, just like real estate. Unlike real estate it pays to have someone monitoring your investment each day, every day and encourage you to take partial profits when your stock is overextended or to encourage additional purchase when it is oversold. Low priced stocks have significant volatility. These actions may increase your return and lower your risk. We are not stockbrokers. This network is designed to be an aid to independent investors. We will pay attention to the securities that are posted by our members and endeavor to be helpful. The greater the number of sources, the more important this intelligence may be for you as a member of this exclusive network. With an experienced curator to screen out issues that are overpriced or that have serious deficiencies, the network will have access to the very best ideas. You may access this information at your convenience. Experts will be invited to aid us in understanding some of the opportunities that are most interesting and least understood by the investing public. We can do this on internet radio, on a go to meeting format or at special networking dinner meetings. Often we may be able to record the event so you may take advantage at your convenience. The network will also focus on the concerns of its members by posting job opportunities and other information that members ask for. Metcalf’s Law- The greater the number of users on a network, the more value the network becomes to the community. The social utility of a network depends on the number of nodes in contact. Programming for this new group is now in development. Web sites, landing pages and communication links are now being created. Invites and announcements are anticipated within two weeks. If you would like to receive an invitation to be a founding member, please send me an email to rkmann@aol.com. We Hear About This Subject Concerning Social Media And Politics. It Applies To Investments As Well! We are all influenced to some degree by media, propaganda and even celebrity opinions. Consider Warren Buffet, Bill Gates or Bill Gross, the bond king. The most successful thieves are often people who live in mansions, drive a Rolls Royce or a Bentley, live large, entertain the elite and attract others who wish to be part of their circle of influence because of their apparent success. Bernard Madoff is an excellent example. We are all influenced in our desire to be part of the elite. High school attitudes do not end after senior year. My expertise is in investments and this headline certainly applies concerning investor behavior. I am the founder and president of a small advisory firm named Advisor’s Capital Investments, Inc. I started my career at Bache & Co in 1969. Bache was then the second largest brokerage firm next to Merrill Lynch at the time. Early in my career I learned to think for myself because the average mutual fund declined by about 75% from 1969 to mid 1974. The Dow Jones Industrial Average bottomed at about 540. During the period from 1969 through 1974 I was given a great deal of advice. Most of it was wrong. I watched as wealthy investors lost enormous fortunes especially those who invested using margin. I found a way to buy out of favor stocks at very low prices. I developed a rules based formula to find the best ones. The results were extremely positive for my clients over a four to ten year period. For advisors and students of the stock market it is important to determine what is predictable and what is not. Seldom do serious students find the lowest common denominator. Students focus on earnings estimates and valuations. I found the lowest common denominator to be long term cycles in individual stocks and industry sectors. I believe that in all markets, real estate, commodities, and stocks you make your money when you buy. The key to wealth creation is to buy low. The question is how to do this on a consistent basis. What has all this to do with the headline of this article. I believe a great deal because you need to determine what you believe between two different schools of thought. Whether you are an advisor or an investor you have to make this choice. For advisors the wrong choice make take away your value proposition. Today, more than ever before investors, even institutions are focused on index investing using mutual funds, ETF’s and large stock portfolios designed to track with indexes. If as an advisor you are simply making allocations, you are not adding enough value for your fee. Larger firms will charge less, advertise more, use artificial intelligence and specialized software to connect better with your client and develop a stronger brand to out compete you. At the same time compliance costs will rise ruining you margins. I believe your opportunity is to take the other side of this argument. This started back in March of 1973. Burton G. Makriel wrote a book which has become a classic entitled, ” A Random Walk Down Wall Street”. Professor Makriel explained that mutual fund managers had not performed any better than a random selection of stocks. What about my own history of stock picking and the rules based approach leading to more consistent substantial long term gains? 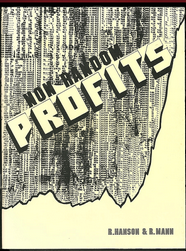 In 1978, Raymond Hanson Jr. and I coauthored the book, entitled, “Non Random Profits”, a counter thesis to professor Makriel’s book. His book was the inspiration for the creation of index funds, but our book would win the argument on facts alone. The history from 1930 to present is conclusive. Even more recently from January 2003- December 2013 the non random type stock selections outperformed the S&P 500 by about 8 times. 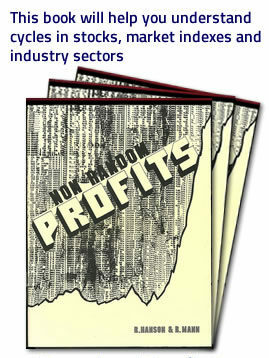 The Non Random Profits approach selected 280 stocks that on average rose 10 times in price. If sales were made at extremes the profits would be far higher. This has been the case for over more than eighty years. The language of truth in investing is mathematics. Most investors have not learned the mathematics of investing and depend on large banks, brokerage firms and well known money managers. They end up buying investments that are heavily owned by institutions at high prices. Yes, during rising markets they make money, but generally do not create wealth. Fact: 50% of daily market activity is unpredictable. Growing earnings are an important factor during a bullish stock market trend. However, historically stocks peak a year to a year and a half before earnings peak. Understanding cycles and investor psychology is most valuable. Profits are based on the second derivative of investor expectations. Wealth is created when an under-owned stock is discovered by a number of large institutions. As the issue makes progress more institutions buy. Often the largest emerging stock moves occur before a company has earnings. The best time to buy this stock was late in 2012 before the stock story was understood and before heavy institutional interest. Why would you buy? Because of Non Random Profits. Concerning this subject it means that to achieve the maximum result you need to do the work. An example would be the law of the harvest. Planting in good soil in the right season. doing all that must be done to insure fertilizer and rain, protecting the crop from insects and varmints and harvesting in the right season. Doing everything right does not insure success because every good thing is under attack. However over time the odds of success are great. Investing is the same. If you plant at the harvest season you are likely to lose. If you are not diversified and have no plan for risk control you probably will not fare well either. Diversification is an intelligent tool, but over diversification reduces profits. I believe investing in indexes does make sense over a long time. However like the law of the harvest, if you plant in the wrong season and don’t do the work of the gardner, history shows you may go twenty years without a profit. In addition over a ten year period you may experience drawdowns several times like in 1987, 2000, and 2008. If you are nearing retirement or become too discouraged you may sell at a low and never recover. In truth the science of investing is more complicated. An active management approach which is diversified appropriately but not over diversified has advantages. Each asset held can be in an uptrend. Weak issues can be eliminated and a daily plan for risk control on each asset can be maintained. An advisor with a smaller base of assets has an advantage. Institutions call these managers Emerging Managers, but instead of taking more risk they can be more risk adverse. Of course there are a limited number of managers who do this well. The high level of expertise should be observable as positive alpha against a benchmark. The difference between index performance and a manager like this should easily observable over a ten year period. Many of these managers are not found on investment platforms because of the cost and reduced margins. Managers under $200,000,000 are not easily discovered by other advisors. Some brokerage firms will not allow their advisors to use them. My firm, Advisor’s Capital Investments, Inc seeks to help these emerging firms find advisors who are independent and can use them. Consider a few examples, one is a professor of biochemistry who has developed a moderate risk portfolio called The Disciplined Equity Portfolio. Over a 10 year period he has performed about 8 times the S&P 500 index with less risk. The manager uses a time-tested approach that includes three major factors related to stock movement: market co variance; industry cycle analysis; and individual investment factors including market leadership. These factors are calculated across major investment sectors. 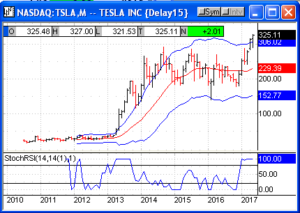 His disciplined decision system and his real time trades have been audited from 2007 through 2014. This is not a recommendation but a discussion about successful emerging managers. For detailed disclosure information send a request to rkmann@aol.com. Of course past performance is no guarantee of future results. Over any given time accounts may incur loss instead of gain. The best of the emerging managers that I like are more concerned with buying the right value by paying the right price than they are attempting to keep up with the market itself. They believe as I do that you make your money when you buy correctly keeping your risk/reward opportunity calculation in your favor. A second emerging manager is a bond manager. He buys oversold investment grade bonds at a discount. He focuses on maturities of 3 to 12 years. He is properly diversified and intends to hold each bond to maturity unless the price rises to an extent that capturing the gain is appropriate. He does use margin for accounts that desire double digit cash flow. His minimum account size is $300,000. He believes he can generate index fund type returns over time with less risk. His performance over the past six years shows he is right on target. A third emerging manager uses Artificial intelligence to manage a diversified portfolio of ETF’s. He has reported to Informa Investment Solutions, a subsidiary of Informa Plc. He won the Investor Choice Award for Independent Asset Management firm of the year -USA in 2014. In addition he was ranked number one for PSN Top Gun ETF categories in 2013. He has won Top Gun recognition multiple times. It is my job to bring recognition to these very special Emerging Advisors. We will provide detailed information to you and share our institutional research with you upon your request. We also are willing to teach and to guide you through the process. Click on the red heading at the top of the page “Make an Appointment With Bob”. Set up a free on line session and learn how you may use stock and industry sector cycle research to improve your portfolio’s performance. This knowledge is useful for investment professionals as well as less knowledgeable investors. I believe it will give you a significant advantage and lessen the risks you take. Last year we recommended a high yield tax free investment with managed volatility. Our rules based historical modeling research led us to the conclusion that this strategy would fit the needs of most of our taxable accounts. We hoped it would provide a much higher return than CD’s, High Yield Bond Funds, and short term bonds both taxable and non taxable. We designed it to be tactically managed to avoid substantial draw downs due to interest rate increases. We eliminated the commissions brokers would charge as front end or rear end surrender charges. The fee charged for management by the funds we used were drastically reduced below retail funds offered to investors in small quantities. Our concept was to sell when the fund rose to what we believed was an unsustainable price and then lost upside price momentum. Our risk control was set to 2%. Our plan was to reinvest when the fund price declined to what we believed was a value price after downside momentum ceased. During the past 12 months our actual results were higher than we anticipated net of all fees and charges. We kept funds in cash for more than 3 months while still performing much better than the fund itself for the entire year. We believe this strategy is an excellent savings strategy designed to build capital ultimately resulting in monthly tax free income. In my opinion it is a good place based on client suitability to deposit free withdrawals from annuities and or mandatory withdrawals from IRA’s. You may invest funds to pay annual life insurance premiums or simply accumulate monies for future tax free monthly income. Building up capital with a goal in mind for monthly tax free income to use in retirement makes great sense. You may have access to funds upon request with 3 days notice to your account by ACH or wire.